Just on the heels of the United States government's debt surpassing $21 trillion comes the news that there are now a record number of Americans who are behind on their record high car payments. According to CNBC, more than 7 million Americans are at least 90 days behind on their auto loans, according to the New York Fed. This is a major concern, considering the average car payment in the U.S. is now $523. "More and more people are buying too much car for what they can afford," said Ed Mierzwinski, senior director of U.S. PIRG's federal consumer program. Overall, auto debt accounts for about 9 percent of total U.S. consumer debt, up from 6 percent in late 2011, separate data from the Federal Reserve Bank of Kansas City show. The amount of Americans currently in default of their car loans is higher than in 2010 when many were still reeling from the 2008 Great Recession, a statistic that is once again, showing that the U.S. economy may not be nearly as strong as the media's talking heads present. The "number of distressed borrowers suggests that not all Americans have benefited from the strong labor market and warrants continued monitoring and analysis of this sector," Fed economists say. Auto debt has soared and with that comes people who cannot pay the bill they signed up for. The dramatic uptick in delinquencies came along with a dramatic $584 billion jump in total auto loan debt. That's the highest increase in car debt since the New York Fed began keeping track 19 years ago. These delinquencies also come as Americans grapple with record levels of consumer debt and student loan debt. 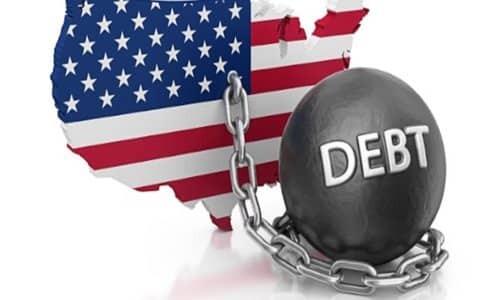 In a report issued Wednesday, U.S. PIRG warns that the continuing rise in auto debt is putting many consumers in a financially vulnerable position, which could worsen during an economic downturn. Coupled with consumer and student loan debt, Americans are staring a crisis in the face. Another economic red flag has appeared and its the closure of retail stores. According to a new report detailing the precarious situation of the current economy, there is "no light at the end of the tunnel" as the closure of brick and mortar stores will continue. Coresight Research released an outlook of 2019 store closures Wednesday, saying, there's "no light at the end of the tunnel," according to several reports, including one from Yahoo News. According to the global market research firm's report, a mere six weeks into 2019, United States retailers have announced 2,187 closings of physical stores. That's up 23 percent compared to last year. Those closings include 749 Gymboree stores, 251 Shopko store, and 94 Charlotte Russe locations. This may not seem like such a big deal especially if you don't often shop, but it's a red flag for the overall economy. Either customers/consumers now have less money and aren't willing to borrow (use credit cards) to spend at stores anymore, or they are already maxed out and cannot spend. Another issue could be the overbearing regulations and burdensome theft (taxation) levied on business. It could be a combination of all of those as well, making the cost of keeping a brick and mortar store open no longer worth it. But reports and the media blame the growth of online sales, rising interest rates, and declining sales. Bankruptcies also are continuing at a rapid pace "with the number of filings in the first six weeks of 2019 already at one-third of last year's total," the report states. That means companies have taken on more debt than they can handle, and much like individuals, when that happens, it is likely the beginning of some very rough times ahead. And debt is a major concern right now for most economists. Consumer debt, student loan debt, auto debt, and the national debt has all reached historic records - and that isn't a positive sign for the economy. Payless ShoeSource is reported to be considering its second bankruptcy and if Charlotte Russe doesn't find a buyer by February 17, the chain plans to completely liquidate, according to a court filing. "The continuation of a high level of retail bankruptcies, with the annualized number of filings year-to-date in 2019 already outpacing the number in 2018," Coresight said in the new report. The economy is very unstable right now, and all the signs of a coming recession on there. Will it happen in 6 months? One year? Two years? No one knows exactly, but the everything bubble the global economy is experiencing now will at some point, deflate.